Hilton Head Island is the 2nd largest barrier island on the East Coast. It is located on the southeastern part of South Carolina in Beaufort County. It is approximately 12 miles long and 5 miles wide. It is 20 miles north of Savannah, Georgia and about 95 miles south of Charleston, South Carolina. In 1663, Captain William Hilton named The Island after himself on an exploration for King Charles II. He was on Hilton Head Island for several days and made notes of our trees, crops and "sweet air". The beginning of Hilton Head as a world class resort, golf destination and retirement community started in 1956 when Charles Fraser developed Sea Pines Plantation Resort. 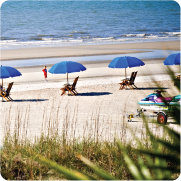 Hilton Head Island is now a popular family tourism destination year round. 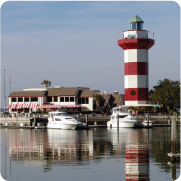 The classic red and white lighthouse in Harbour Town is considered one of America's most famous landmarks. With an eclectic mix of shops & boutiques, restaurants and activities, families have been making this island their vacation spot for generations.